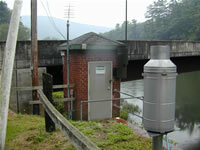 LOCATION.--Lat 41`31'18", long 77`26'52", Lycoming County, Hydrologic Unit 02050205, on left bank at upstream side of highway bridge on Township Route 762 at village of Cedar Run, 2,000 ft downstream from Cedar Run, and 1.2 mi upstream from Gamble Run. PERIOD OF RECORD.--July 1918 to current year. Prior to October 1918 monthly discharge only, published in WSP 1302. GAGE.--Water-stage recorder and weighing bucket precipitation gage. Datum of gage is 780.36 ft above National Geodetic Vertical Datum of 1929. Prior to Feb. 13, 1930, non-recording gage at same site and datum. Satellite and landline telemetry at station. COOPERATION.--Funding for the operation of this station is provided by the Pennsylvania Department of Environmental Protection, and the U.S. Geological Survey. Supplied by NWS: Action stage-7 ft, river interests monitor conditions; Flood stage-12 ft, few residences along left bank of Pine Creek in vicinity of Cedar Run are inundated; some homes and cabins in vicinity of Jersey Mills affected; Moderate flood stage-13 ft, high water affects numerous homes and cabins from Cedar Run downstream; Major flood stage-15 ft, many homes and cabins along Pine Creek are affected by high water.